The gift swap is being run by Viola from A Piece of Viola blog (from which I have shamelessly plagiarised a lot of this post). I’m hoping she won’t mind so much as I want to make extra sure I explain everything correctly. 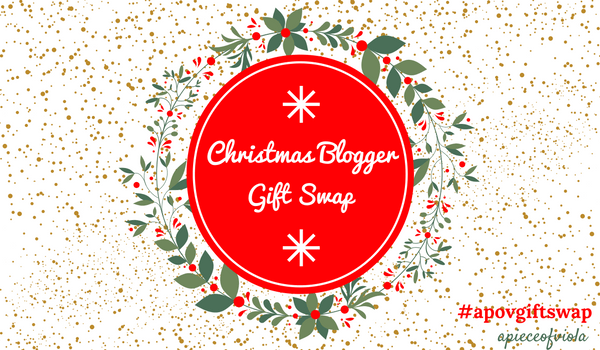 The gift swap is open to all bloggers, regardless of whereabouts you live in the UK, regardless of how big or small your blog is, and regardless of what ‘type’ of blog you have, so why join in and get involved! This event is designed to get bloggers interacting with each other during the festive season and to do a gift swap. It’s a chance to get to know others and discover a variety of other amazing blogs out there! All bloggers will be paired up at the start of November and there will be a period of time to get to know them before we have to send them some lovely Christmas gifts. Viola makes it clear in her post that there is no requirement to spend a massive amount of money. It’s ultimately down to the individual blogger how much they spend, although she does suggest it might be worth setting a budget with your partner. Either way it sounds like lots of fun and I can’t wait to start planning what I might send. Fill out the Google form here. Once you’ve completed it, you’ll get a confirmation from Viola. I got mine the following day! Once paired up, get to know your fellow blogger, buy their gifts and send them off! November 1st: Deadline for completing the submission form. By December 17th: Send off gifts to your blogger partner. Fill in the Google form document – here’s the link again. Write a blog post about this event within five days of receiving confirmation. Send a couple of nice gifts to your paired blogger by December 17th. Write a post about your gifts (must include photos) after you have received them. Send links to all of your blog posts to Viola so she can see how the event has gone! If you want any more information you can contact Viola on Twitter or Instagram (@violahelen_) or email her at apieceofviola@gmail.com. Or head over to her blog post and leave her a comment in the comment section. You can also use the hashtag #apovgiftswap on Twitter or Instagram to connect with others! I can’t even being to describe how excited I am about taking part in this! I’ve always wanted to do one of these gift swap things! It’s going to be fab! Leave me a comment below if you decide to join too! It’ll be nice to know who else is involved! This entry was posted in Blogging, Christmas, Lifestyle and tagged a piece of viola, bloggers, christmas, gift swap, join in.